THE TORTOISE AND THE HARE & OTHER TALES entertains children, adults, musicians, and teachers alike with new and familiar stories narrated by Broadway star Ann Crumb and TV/movie personality Ukee Washington. With music performed by the Symphony in C and conducted by Rossen Milanov, Daniel Dorff's musical stories are the perfect introduction to classical music for children! The music on this CD has already been performed by these orchestras. Hear it for yourself through the links below! INTERVIEW: ASCAP's "Audio Portrait" about the CD. "Composer Daniel Dorff was asked to compose music for a series of shows that would cover the joy of various children's fairy tales and stories. The Tortoise and The Hare & Other Tales (Bridge) is a CD that honors his work and the stories that have excited children for decades, and does so by utilizing a full orchestra as well as smaller groups. "Blast Off!" and "Billy And The Carnival" are the pieces with full orchestral arrangements, both featuring narration from Ukee Washington, a news anchor on Philadelphia's CBS3. When he asks the listeners if they ever dreamed of being able to fly into outer space, one can imagine a child feeling as excited about the possibility as they are hearing Washington, perhaps believing he may have been someone to take flight as well. Dorff's music steadily shows the anticipation of that flight before eventually heading beyond the atmosphere, and I'm sure Washington had a lot of fun doing this. Actress Ann Crumb handles the narration for "Goldilocks and the Three Bears" and "Three Fun Fables," these accompanied by smaller orchestras. For those who may know her for her singing (she was the vocalist on a double CD which displayed her father's work, Complete Crumb Edition, Volume Ten (her father being composer George Crumb), you will no doubt be delighted by her spoken performances here, especially in "Goldilocks and the Three Bears." Again, the music in these pieces is enthusiastic, and hopefully the listener will be moved and remember these versions of the stories when they grow up. For the adult, I think it's nice to hear these stories done in a manner that isn't dated. It reveals the power of classical music, and of course the beauty and mystery of the human voice, all meant to prepare a child for the big world they will become a part of when it is their time." "Daniel Dorff's compositions cover the full range of concert music. His works for young audiences are wonderful orchestral renderings - some with original lyrics - that tell fun stories while teaching about music, instruments and orchestras. 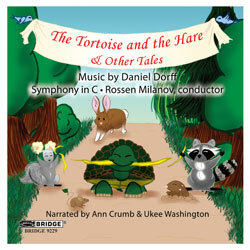 "The Tortoise and the Hare & Other Tales" collects four of his commissions with strong performances by vibrant narrators and the notable Symphony in C orchestra." "Dorff's works have already begun to establish themselves with programmers looking for repertoire for children's concerts, and that's a significant contribution to the future of classical music. BLAST OFF! - An original travel guide to an outer space visit, composed for a real NASA astronaut to narrate, the music to BLAST OFF actually went into outer space on the Space Shuttle's 100th mission in 2001! AUDIO EXCERPTS and more about BLAST OFF! GOLDILOCKS AND THE THREE BEARS - The familiar tale, told in cartoon style with a very bumbling Papa Bear and cute little Baby Bear, and a surprisingly polite Goldilocks! BILLY AND THE CARNIVAL - A new story about a boy's trip to his local park where he discovers all the instruments of the orchestra on their way to a carnival. An ideal introduction to each instrument's sounds. THREE FUN FABLES - The Fox and the Crow, The Dog and his Reflection, and The Tortoise and the Hare, told in cartoon style with lots of giggles, and each animal portrayed by a different instrument.